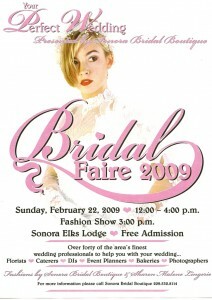 Sonora, CA.....Bridal faire season has officially arrived. Don’t miss one of the best up-coming bridal shows in our area. “Your Perfect Wedding” Bridal Faire is hosted by the Sonora Bridal Boutique this Sunday Feb 22nd, held at the Elks Lodge in Sonora from 12-4pm. The fashion show will be held at 3:00pm sharp. FREE ADMISSION and over 40 of finest local wedding vendors. See you there!